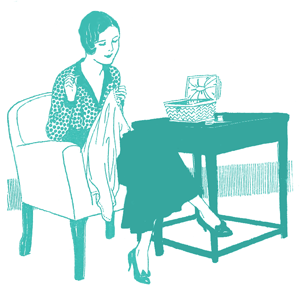 I’m coming to the end of the fantastic textiles that Elise sent. I have just today’s dress, and then one more dress (and it’s a doozy – I’ve saved one of the best for last) to show you. 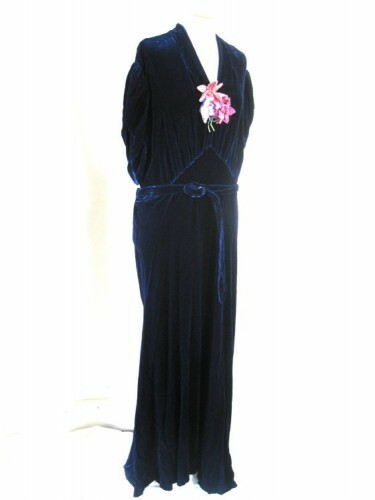 Today’s dress is another velvet item, this one in the same glorious midnight blue of the leaf-patterned devoré dress. 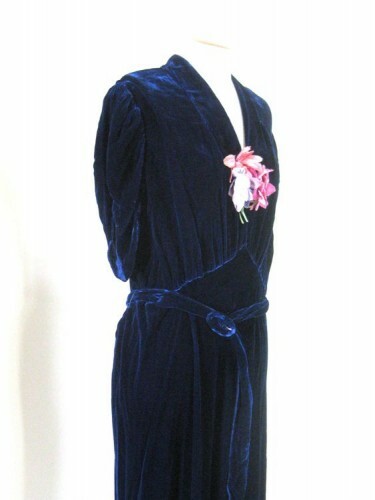 Midnight blue velvet was an incredibly fashionable colour & fabric in the mid-late ’30s. 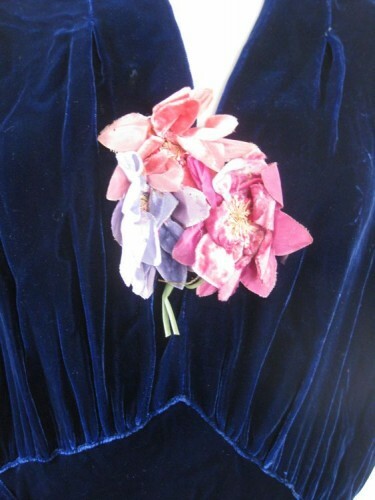 The velvet is accessorized by a posy of flowers in lavender, peach & pastel-magenta – such a lovely, quirky, completely 1930s touch. 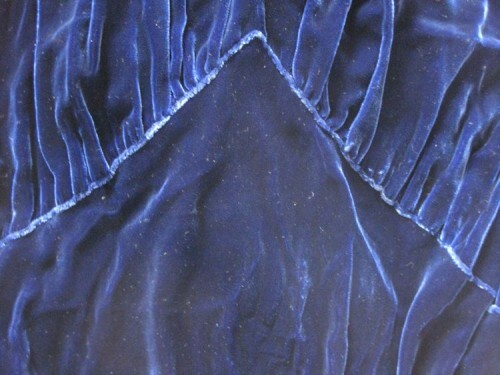 In addition to being made of a similar fabric, this dress shares an almost identical cut to the devoré gown – with an inverted V waist, a gathered bust, full sleeves, and a bias skirt. It even shares the clever tucked pleat collar construction, as you can see in the photo above. Alas, not only does the dark clolour mean the dress is tricky to photograph well, it isn’t looking its best because it doesn’t remotely fit Isabelle. It is unusually large for a 1930s dress – probably a true size 16 or 18, and made for a figure with a prominent bust and slim hips. I’m searching for the perfect model to wear it for one photoshoot – no more, because the fabric (like that of the devoré dress) has tiny holes, and is rather fragile. The flowers are particularly fragile and moth-eaten, but you can still see their charm, and how fantastic they would have looked when the dress was new. I wonder what they would have called the colours in the 1930s. Wisteria, coral and mauve perhaps? The fabric may be hard to photograph, but it is quite scrumptious. 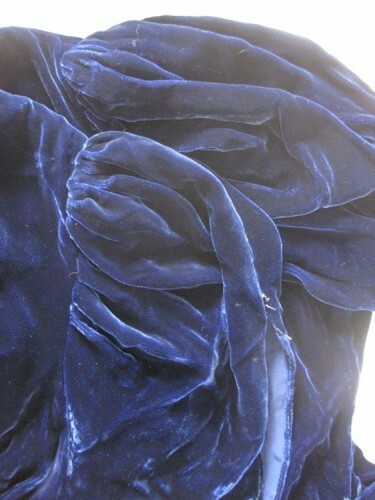 It’s a rayon velvet, with a slightly open pile (so not the very best quality). It’s still fantastically soft and pet-able. 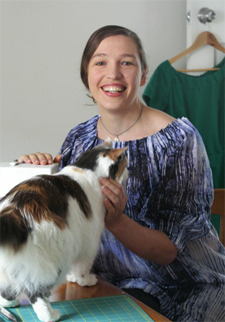 The dress construction isn’t of the highest quality either – it’s clearly the work of a home seamstress, and she had a rather hard time getting the front V of the bodice right. It looks decent in photographs, but on a body the V is ever so slightly off, and the velvet is noticeably squashed. 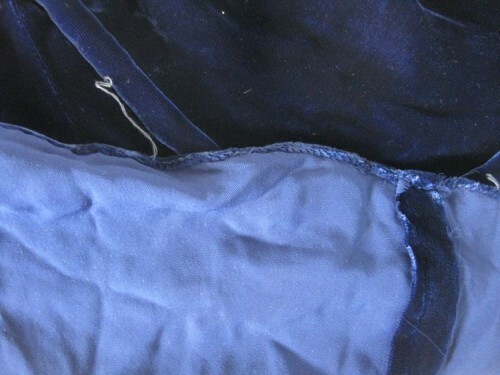 She did do a rather decent job of making a tiny rolled hem around the bottom of the sleeve edges and the hem of the skirt – no easy task with the velvet fabric. 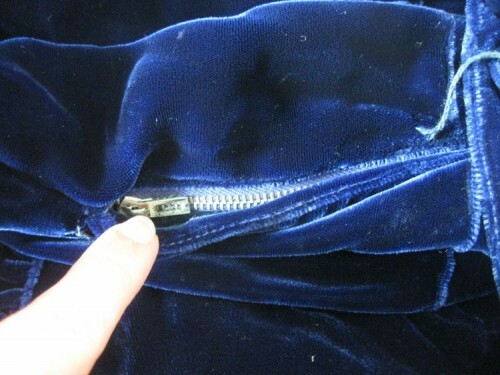 As with many 1930s evening dresses, the interior seams are left unfinished. 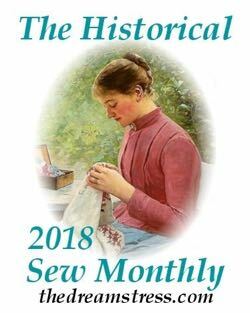 The fabric isn’t particularly susceptible to fraying, and, as the fabric wasn’t meant to be washed, and the dress wouldn’t have been worn that often, the raw edges would see minimal stress. The dress fastens with a size zip – one of those fantastic early models with metal teeth that just last and last and last and never pop open at inopportune times. 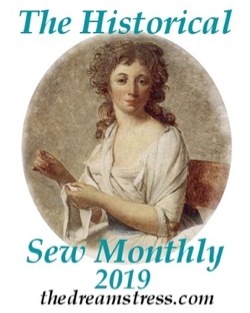 It’s a fantastic illustration of how important the invention of the zipper was, and how quickly the new technology was adapted by everyone from couture designers to home seamstresses. Despite it’s universal adoption, few designers and seamstresses (with the notable exception of Schiaparelli) valued it aesthetically, and so every attempt was made to hide the fastening. In this dress, a lapped opening does part of the job, and the belt helps with it, holding the lap closed, obscuring part of the zip, and doing the bigger job of accentuating the waist. 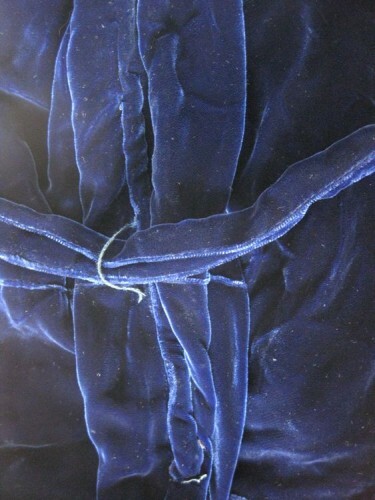 The belt is held on with hand-worked loops of heavy blue thread that has faded with age. So there it is – not the fanciest dress, not the most interesting in construction, not the best made, or the most innovate and unique, and not the most valuable in a technical sense. And yet, that makes it all the more interesting and valuable, because it really does represent what the average woman would have worn for her nice events in the mid-late ’30s. And she probably felt beautiful in it. I wonder if, like me, she particularly loved that posy of flowers: the bright, quirky combination of colours, and the sense of life it gave. Yesterday, I watched a Czech 1939 film, and yes, there were ladies with posies situated like that (at least one, that is). The colours really pop against that midnight blue! Ok, I love these columns, because it is fun to find out so much about the dresses. This one reminds me a lot of the blue dress worn by Frances McDormand in Mrs Pettigrew Lives for a Day. 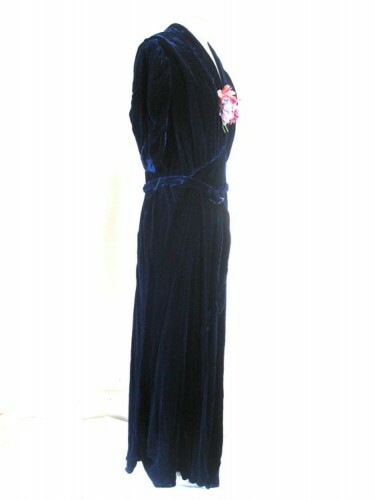 Whenever I see entirely velvet gowns, it makes me think of grandmas. Which, I guess, is appropriate since my grandmother lived around that era. But this kind of gown might bring me around on my opinion of velvet. I love that you are able to break down the areas where this home seamstress had issues (I think I would, too, with that V!) and where she did a good job. It makes me think she had sewing days like mine where everything goes wrong and eventually you throw your hands in the air and say “screw it, that’ll do!” But then equally satisfying days where one can be proud of a tiny hand-rolled hem! Thanks for showing us these gowns (can’t wait for the last one!) and adding your helpful comments! Yup, I’ve said screw it…no one will notice. And when that lady wore that dress she probably fit right into the crowd and looked sweet. Unless there was a professional seamstress in the room no one would have noticed the slightly off waist. I’m thinking the poor girl bought a pattern that was a step up from her usual challenge level and had to do some hacking of that to fit her particular, unmaniquin shape. Thumbs up to her! I can see that. Like I said – very popular style! Oh, I’d love to see that! The color and fabric are beautiful, even after all these years. I’m not sure the belt suits it. Otherwise, I wouldn’t mind having one in my size. If you ever come to Idaho . . . .
That’s such a lovely dress. I hope you find a model for it soon. I’m doing my first shopping at Boden, and was sad to see that I’d be a size 8. Actually, I’m probably more than that, and I’m certainly not the size 2 that JCrew says I am. I’m perfectly vain, and understand why companies shrink size numbers, but what were the original sizes? When did sizing come about? Such a pretty neckline! The belt doesn’t seem such a great idea with the inverted V of the bodice, though. How to make a woman look bigger than she need. What a pretty dress. 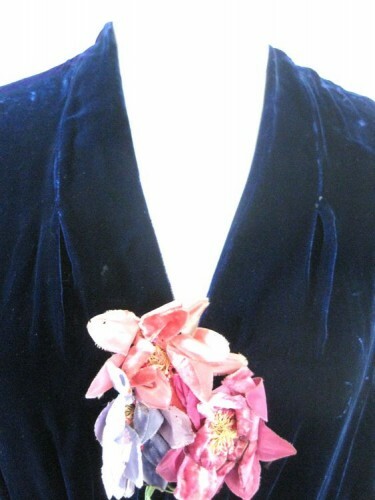 The posy reminded me of a bouquet of fabric flowers my mom has. 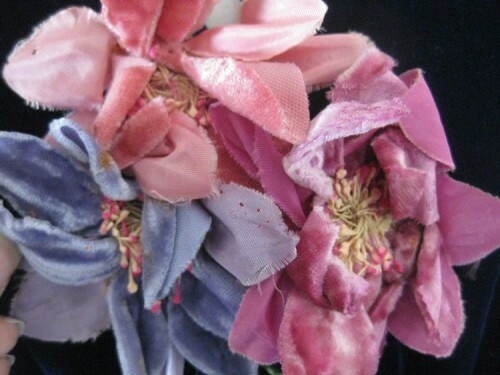 They were a gift from her aunt who made them from her old dresses. Previous PostTerminology: What is botany wool?